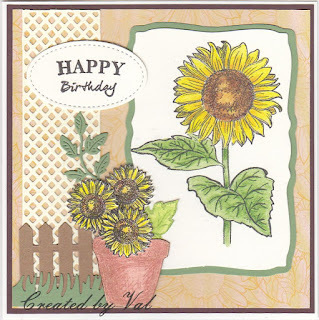 The weather here was lovely yesterday with plenty of sunshine but this morning is grey and rainy so I'm sharing a second sunflower card to brighten things up. I actually stamped and coloured two images the other day and decided to make two slightly different cards with them (rarely make the same design more than once). You've already seen one of them; here is the second and this time I incorporated the flower pot and some smaller flowers from the same stamp set along with a spare fence, trellis, some grass and a couple of leaves from the die cut scraps 'pot'which sits on my desk. Again the image was coloured with Inktense pencils and the background paper was another one from the free pack which came with the magazine. Scissors were used to cut out the pot and tiny sunflowers which are 3D. Sentiment - from free stamp set and stamped onto Stampin' Up stitched shape. 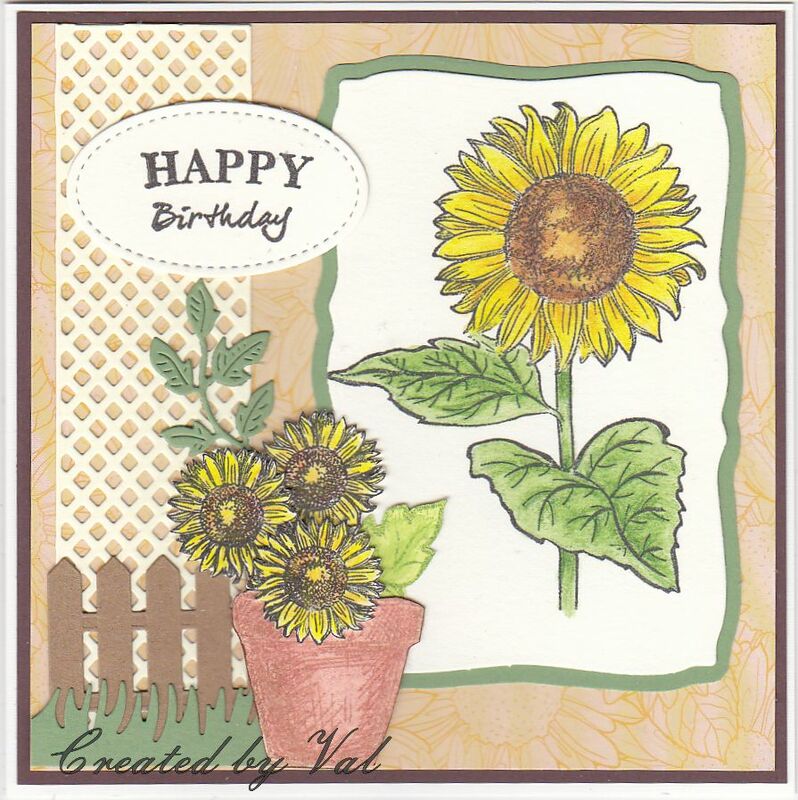 A gorgeous card Val, it certainly brightens the dark rainy weather here right now. Of all days I have to go out today too. First congratulations on being a top pick in the latest Butterfly Challenge Val. A lovely bright and happy card .. .. especially to brighten up what has been a very mixed bag of weather here.